Muhammed Abu Marzouk is seen here receiving treatment after his alleged violent encounter in Mississauga, Ont. Photo from Launchgood. It was supposed to be a peaceful summer evening outdoors with friends, but things took a frightening turn when a Mississauga, Ont., father of two was severely beaten in what Peel Regional Police confirm they are investigating as a hate-motivated crime. 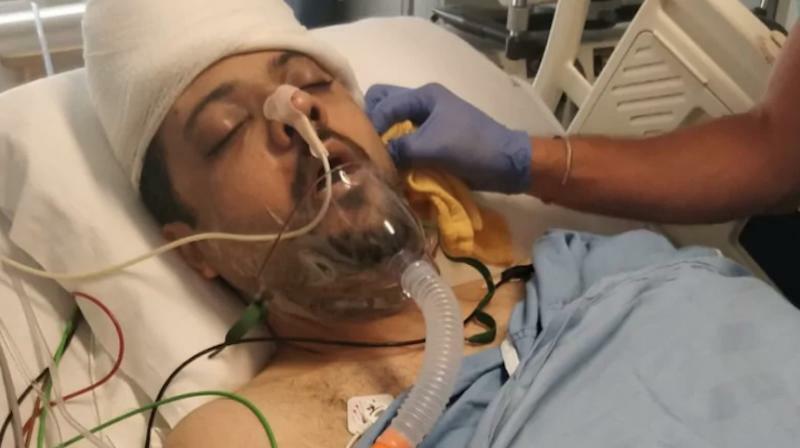 Mohammed Abu Marzouk, 39, was just about to head home from a picnic he was attending with his family near the Mississauga Valley Community Centre on Sunday night when two men passing on foot behind his car started shouting at the family, "f--king Arab people! Terrorists," his wife, Diana Attar, said in an exclusive interview with CBC News. "You didn't see us!" the pair shouted before allegedly kicking at Abu Marzouk's car. Police say they have no indication that anyone was struck by a vehicle before the violence broke out. Abu Marzouk got out of his vehicle to talk to the men. When he did, Attar says, one of the men punched him in the face. A friend of the couple who was also at the picnic that night came over to try to break things up. He suffered minor injuries. "Please don't touch him, please don't hurt my husband. I have two little girls, please don't hurt my husband," Attar remembers pleading. Nearby, she spotted a police car and ran to ask for help. When she returned, her husband had fallen to the ground, blood spilling from his ear and pooling around his head. Moments later, he lost consciousness and Attar began reciting prayers that Abu Marzouk would survive. As she leaned over her husband to hold him, Attar says, she was kicked too. The father of two was rushed to a Toronto trauma centre with what his family says were multiple fractures to the face along with brain hemorrhaging. Almost immediately, he was taken into surgery where Attar says they "removed a part of his skull" to stop the bleeding and put on a breathing tube. All the while, Attar says, her four- and six-year-old daughters were asking her if their dad had died and if they would ever see him again. Two Brampton men, brothers aged 19 and 27, have been charged with one count of aggravated assault and two counts of assault. The pair appeared in court Monday morning. Initially, Peel Regional Police were treating the incident solely as one of road rage. But by Tuesday night, that changed with police confirming they are now investigating the attack as hate-motivated. "We were provided information that the initial incident started as a result of the road rage, a dispute that happened in the parking lot. Witnesses subsequently came forward and talked to investigators and provided them with some statements that were made while the incident was unfolding by the two arrested and charged males," police spokesperson Akhil Mooken said. Mooken would not confirm the specific statements made by the men citing the ongoing investigation, but did say investigators are consulting with the Crown attorney's office. For a hate crime charge to be laid in Ontario, the province's attorney general must provide consent. Fuat Yucel, the friend who tried to intervene in the incident, said he's never seen anything like what he saw Sunday night. "I've lived in this country for 39 years, I've never faced this ... There's absolutely no doubt. This is a hate crime," Yucel said. "Islamophobia? It does exist." Ibrahim Hindy is the imam of the Dar Al-Tawheed, the mosque where Abu Marzouk's family prays. "My kids play with their kids," he said. So when he heard that that 39-year-old was in hospital, he rushed over to visit. "I didn't realize the extent of how badly beaten he was," said Hindy, who took to social media to raise awareness about the incident Tuesday because the family "felt like they weren't being heard." That police are now treating the incident as hate-motivated was welcome news to Hindy, who points out the number of anti-Muslim hate crimes reported to Peel police last year jumped 91 per cent. "They were calling them Arab terrorists, so clearly their religion, their ethnicity was playing a part in that. We have to be concerned about hate against any community, but this is a significant issue that's happening," said Hindy. "We as a society have to start recognizing the fact that hate is alive here. It was a very significant motivating factor in this attack and that needs to be acknowledged in order for it to be dealt with." A LaunchGood fundraising page set up in support the family states Abu Marzouk was the sole breadwinner and that his recovery could take several months. For her part, Attar remains shaken, the image of her husband being kicked replaying in her mind and the smell of the blood pooling around him still with her. She's also left wondering why — if the sight of her hjiab when she poked her head out of the window might have set the men off. "I would have lost him if the police didn't come, I would have lost him ... for nothing."